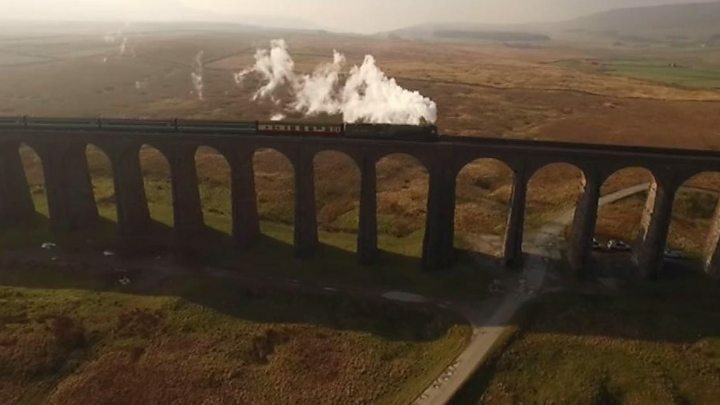 More than 5,000 people travelled on the first timetabled steam train service on the Settle to Carlisle railway line in 50 years, Northern Rail has said. Tornado, the newest steam locomotive in Britain, pulled 12 Northern services over three days from 14 -16 February. The company described the event as "a remarkable success" and has not ruled out running similar services again. It was part of celebrations to mark the upcoming reopening of the line after landslides closed a long stretch. Paul Barnfield, Northern Rail regional director, said: "During the three days just over 5,500 people travelled on the steam services and it was great to see so many entering into the spirit of the celebration. "This was the first timetabled steam service in England for almost 50 years and to be able to bring Tornado to such an iconic and visually stunning line, as a way of saying thank you, was a genuine pleasure." Graeme Bunker, of the Darlington-based A1 Steam Locomotive Trust, which built Tornado, said: "To see the many thousands who travelled and many thousands more enjoying the event at the line side made the endeavour very worthwhile and delivered a welcome boost to the local community after recent challenges. "I am very proud of my team for their part in ensuring the services ran so successfully." Douglas Hodgins, of the Friends of Settle to Carlisle Line, added: "There must be lessons here about the demand for steam, scenery and rail travel in general. It was the perfect curtain-raiser for the reopening of the line on 31 March." It took 18 years for the trust to build the £3m Tornado 60163, which can achieve speeds of 75mph (120km/h). It was completed in 2008. The Appleby to Carlisle stretch of line closed in February 2016 after a 500,000-tonne landslip at Armathwaite.